When did Marie Kondo become a verb? I would say that it happened when her book became the basis of a Netflix series. Before then, she was just the author of that book about folding your clothes and throwing things away if they didn’t “spark joy.” I was an early adopter to the KonMari method (yes, that is the official name) after reading Kondo’s book a couple of years ago. While I didn’t Kondo the entire house it one fell swoop (seriously, I would need to take a leave of absence from my job to do it according to the Kondo specifications), I did do my own clothing – and later, the family books. I will tell you that my sock drawer, my workout clothing drawer and my pajama drawer are still in tip-top shape. Once you Kondo, you will never go back. Getting the family to buy into this method was a different story. I have teenagers, remember. The whole idea of folding anything goes against their nature. They hid my book on me. They even hid my label-maker (gasp!) So, tidying up the shared spaces in our home was going to take some buy-in from my husband and my kids. So what drove me to finally Marie Kondo the kitchen? Well, there were a few driving forces. First of all, we have limited space and our cupboards, where we store food, were getting very messy. My dietary issues were really to blame. I now snack on a lot of different nuts – which means that we had little bags of a lot of different nuts – and that was one big sloppy mess. And that was all that my 15 year-old-son (Primary Eater of Cheez Its) could see when he opened the cupboard. He complained that we had no snacks that he liked (because he couldn’t see them behind all my bags of nuts) – and none of us really had any idea of what was in the cupboard or what needed to be replenished. But the biggest impetus for finally getting my act together in the kitchen? My husband and I were heading out for vacation for six days and my mother was moving in. Enough said. So, I followed a lot of organization experts on Instagram and got very inspired. I ordered some containers from Target.com. I demanded my label maker back. And I went to town. I found that by taking it one shelf at a time, organizing the kitchen cupboards really was a manageable task. I ordered some of these small $4 containers from Target, a few medium sized containers for $6, and large containers (for cereal) for $8. I supplemented with catch-all containers from The Container Store. Was it an expense? Yes. But the containers definitely keep food fresher longer than if they were in their original container. The biggest benefit, though, is being able to see what you have. You immediately know what needs replenishing. I also found that by having everything visible, my son (Mr. Cheez It) started branching out more. I loved the day that I found him opening up the raisin container to snack on those. Marie Kondo advises that you sort by category (not by area) – however, I find that it really is a mix of both. Even when I watched the Netflix program, I found that at some point, Marie sent her clients to the kitchen or garage to sort & clean. (I could only watch one of those, by the way. When I realized that I was spending my evening watching people cleaning their garage, I thought I had hit a new low in middle age or suburban life – maybe both). I really like The Container Store for their quick tutorials in how to tackle a problem area – like under the kitchen sink. These guys truly have figured out some of the best solutions for organizing some annoying spots. Follow their suggestions and you can do it quickly. So, should you Marie Kondo your kitchen? My answer is a resounding “yes.” Even if you start with a small drawer, one shelf, or just the door of your refrigerator. You will be amazed at what does not spark joy (or what is out of date) and how much lighter you feel when you unload it from your home. Also, you only have a few more weeks that you will have any inkling to embark on such an activity. When the truly nice weather sets in for good, you won’t be Marie Kondo’ing until January 2020. So, do it now. What Do I Do With My Stuff That No Longer Sparks Joy? Great Question! For food that is still in date, consider donating to the Mansfield Food Pantry. Donations are accepted on Saturdays between 3 – 4 pm. More information is available here. For clothing and other household items, church thrift shops are a good option. My mother volunteers at her church thrift shop and she tells me that they are getting inundated with donations due to the Marie Kondo effect, so it’s good to check and see what is accepted. Another forum that I have discovered is the Buy Nothing Project. There’s Buy Nothing Mansfield or you can find your local neighborhood forum on Facebook. When I cleaned out musical toys, for example, last fall, I posted them in my neighborhood’s Buy Nothing Project, put them out on the sidewalk, posted a curb alert, and they were picked up by a local parent who could use them – all in seven minutes. When did March become the new January? Spring (according to the calendar) is a mere ten days away, and here we are, digging out from more weekend snow. We’ll probably have skiing until the end of April – which is great – but by this time of year, I’m ready to shed my winter coat and gloves and just lighten up already. There’s no fighting Mother Nature. We can dress like it’s Spring, and eat like it’s Spring – but guess what? We’ll freeze. And so, I’ve settled into making my healthy version of homemade chicken soup until the weather breaks. I’ve been making homemade chicken soup for years. My mother made it. She learned, I believe, mostly from our Italian relatives, specifically my Uncle Ralph, how to take the leftover bones from a chicken (or turkey, or whatever) and make it into a stock (or broth) which would become the base of your soup. Fast forward to today, where everyone is trying to add bone broth to their diets for its many benefits (speeds healing, fights inflammation, aids digestion, promotes strong healthy bones) – and I guess my mother was ahead of her time. My “healthy” version of chicken soup is really an Italian Wedding Soup with a few twists. I always start my chicken soup by roasting a whole chicken or four bone-in organic chicken breasts in my clay pot. Wait – what’s a clay pot, you might be asking. Well, if you don’t know, it’s definitely time to find out. A clay pot roaster is just that – a roasting pan, made of clay. The bottom is glazed, but the top lid is not. You soak the top lid in water before roasting, and in the meantime, place your meat, vegetables and spices in the bottom. Place the whole thing in a cold oven, turn up the heat and the results are amazing. Everything comes out tender and delicious thanks to the steamy and even-temperature environment of the clay pot. I like to add fresh lemon, thyme and sage to my chicken. I layer the bottom of the clay pot with lemon slices. I also stuff the cavity of the chicken with lemon and fresh thyme and sage. I also brush the chicken with melted ghee and lemon zest. After getting one dinner of roasted chicken out of the clay pot, it’s time to make bone broth. I reserve the excess chicken for the soup. Then, I toss the bones in one of my big soup pots. I cover with cold water, add whole black peppercorn and bring it to a boil. You may also add vinegar to help leech the minerals from the bones. Reduce the heat to a simmer. Cook for at least four hours. Strain the broth through a sieve to ensure all of the bones and cartilage are removed from the broth. From here, the rest is easy! Bring the broth back to a low boil. Add carrots and celery. Cook until fork-tender. Add chicken. Stir in escarole. Cook until it turns bright green. Add meatballs and stir until they are cooked through. Add kosher salt and fresh ground pepper to taste. I just know that one of these days, I’m going to look up from my bowl of chicken soup and see that the snow has melted, the robins have arrived and the trees have budded. In the meantime, I’m going to stay warm and healthy. And I hope you do too! Last Fall, Tom & LeAnna Sheehan launched their first 6-week Nutritional Transformation program. 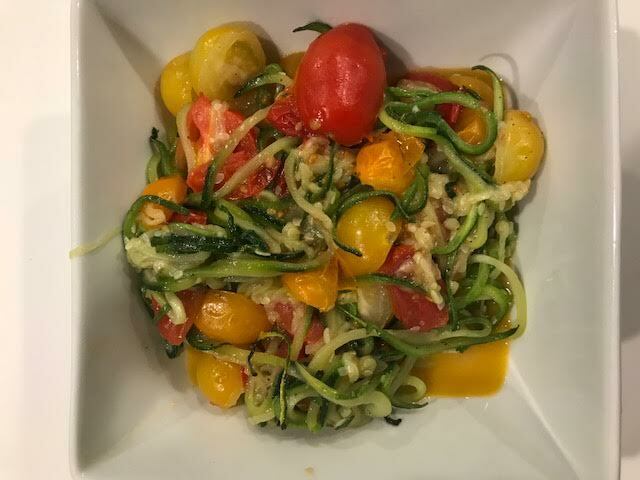 This was a group of 10 participants who re-set their eating strategies with guidance, meal plans, a weekly meeting, coaching, support, macro-counting, and on-line food journaling. Together, this first group lost a total of 146 pounds and 81 inches. Participants from that first group (which finished up in November) report that they have kept their weight off. Tom and LeAnna ran another group in November with similar results. They will soon open up registration for their March Nutritional Transformation program, which they limit to only ten participants in order to provide all the participants with due attention. I had the unique opportunity to catch up with several of the Fall and November program graduates and they are a truly inspirational group of people. While they all joined the program for different reasons, they all came out feeling better, they all learned something, and everyone lost weight. I would also note that everyone struggled at some point during the transformation process. But what resonated through my on-line chats and emails with the Nutrition Peeps was the “tremendous support” they received through their process. Rick Studholme, joined the Sheehan Nutrition Transformation Program when he felt he needed a re-start. “I had fallen on some old bad habits. I was snacking and slowly that started to add the pounds back on. Work and life had become so hectic that I had lost my focus on my nutrition. This program was a good way to jump start my weight loss right before the holidays.” Rick cut out sugars and processed foods – and of course, the snacks. He focused on eating one main meal a day. He also learned meal planning strategies and techniques. Rick commented on the weekly support group, “Many are feeling the same things you are. It is uplifting to talk and hear that. You are not alone and others are experiencing the same things you are.” Rick exceeded his weight loss goal by 10 pounds! Pat Donahue joined the Sheehan Nutrition Transformation Program not to lose weight, but just to learn more about nutrition. “This was just a great opportunity to acquire additional information about nutrition and the impact that foods can have on your body. While it was not my goal to lose weight, I did lose a few pounds.” Pat cut out occasional snacks. Pat initially also missed having the occasional glass of wine when going out with friends. However, she learned some valuable new lessons. She learned about the importance of having real meals with real food (and how easily they can be prepared) – instead of relying on protein bars. She also learned how to recognize and count macros – and how to determine their impact on her daily diet. One thing that all of the participants resoundingly said was that “YES” – if you are thinking of trying the Sheehan Nutrition Transformation Program, you absolutely should do it! Whether you are looking for a head to toe, inside/out, spiritual + body journey like Diana, or if “nothing is working and I don’t know why!” anymore – like Vicki. Or if you’ve slipped back into some habits and you need a kick-start like Rick. Or perhaps you are looking for some new information, like Pat. Or perhaps you have a different reason. What have you got to lose? Very special thanks to Dr. Diana Perry, Vicki Kane, Rick Studholme, and Pat Donahue for their contributions to this blog post! And just like that we’re into the chaos of the holiday season! Our calendar gets booked up with open houses and parties every weekend. It’s a wonderful time of year – but the festivities and frenzied pace can quickly take their toll on your body and soul if you aren’t careful. One strategy I’ve put into play for a long time is to bring something plant-based to every gathering. For my own Thanksgiving last week where we hosted family, I added this Make Ahead Salad from Real Simple Magazine. I wanted to try it out ahead, so I first made it for a Friendsgiving that we held at my office earlier in the week. To be honest, the first time I made it I was cursing the editorial staff at Real Simple. While the ingredient list is rather short (kale, Brussels sprouts, hazelnuts, pomegranate seeds) – each ingredient needs quite a bit of attention. The hazelnuts need to be roasted and then you need to rub the skin off. The Brussels sprouts need to be chopped up very finely in a food processor (and I only own a very small food processor). My second making of the salad went so much more smoothly. What did I do differently? Well I bought the POM Pomegranate Fresh Arils. I also bought hazelnuts that were already de-skinned. They toasted up just as nicely in the oven. This salad is a little bit of effort, but it’s worth it! At the Friendsgiving, I had several people tell me it was their favorite dish of the event. One of my colleagues told me that he is an avid meat-eater, but the salad was what he liked the most. The salad was also a bit hit at Thanksgiving – and it was just in time for the news of the E. coli outbreak linked to Romaine lettuce. · You can make it ahead – even put some of the dressing on it – because the kale and Brussels sprouts hold up so well. I made it the night before each event. Make Ahead Salad is a good name! · It holds up for days. This salad has some serious staying power! We were able to eat leftovers for a couple of days after. · It adds something green to the table. So often the holiday spreads are all carbs and butter. · You can keep it healthy – or add some “celebration.” The recipe calls for homemade bread crumbs (which I made) – and they smelled amazing. I’m gluten-free, so I kept them separate from the salad. · It’s not Romaine. I just had to say it again. I’m so glad that I didn’t serve my entire office a Romaine salad the week before Thanksgiving. We loved this so much, we’ll be making it even after we ring in 2019! Make Ahead Salad recipe is here. For more holiday tips, check out my 2017 post, the Twelve Days of Stress-Less Christmas. There are some good nuggets in there. I’m pretty sure that if you’ve gotten to the bottom of this post, you are the Knower of All Things in your household and you are already feeling a little bit stressed about the upcoming holiday. Living where we do, just a stone’s throw from Gillette Stadium, there’s no escaping weekend football gatherings. Whether you are a season ticket-holder, tailgating every weekend, or just a casual Patriots fan, you are finding yourself at a football party of some sort. For me, it was our neighborhood block party. This year’s theme was football. There was even a chicken wing contest! But instead of bringing another wing recipe, or another cheesy dip, I decided to make something for a small subset of my neighbors. There are a few of us who follow a gluten-free diet, (and some other food restrictions) – and I wanted to bring something that we could really dig into (other than the obligatory veggie tray. So, I came up with this Shrimp Quinoa Salad. I started with a bag of Trader Joe’s large de-veined, raw shrimp that I sautéed in coconut oil. I tossed the shrimp with 3 cups of cooked quinoa, a diced red pepper, a cup of cherry tomatoes (halved), chopped cilantro, lime juice, sea salt, and olive oil. It was delicious! And at the party – my Shrimp Quinoa Salad was gone in a flash! You can eat something more nutritious than traditional football food – and still have a great time. I used to buy into the “It’s not <insert special event name>, unless I eat <insert unhealthy food name>”. On Thanksgiving, I would eat dinner and then have dessert. Then later, I would have a turkey sandwich (on a roll, with cranberry sauce and gulp, mayo) and then, even more dessert. All in one day! Did you know that the average American consumes 4500 calories on Thanksgiving? It’s crazy! And maybe that would be OK. Except for some, Thanksgiving is not just a day. It is the first day of an entire four-day weekend of eating like the day I just described. · Instead of the food, what is it about the holiday that gives you the most pleasure? How can you emphasize that? For me, it has been making sure that all my guests have a few moments to privately reflect on gratitude. I have a “What Are You Thankful For” Jar in a quiet place so that everyone can write words of appreciation. We share them later – usually after our meal. · Consider adding a salad bar to your holiday menu. I know, I know – anyone who is hosting the holidays is going to say “WHAT? You want me to make dinner – AND then a salad bar too?” Let me explain. My sister first implemented this idea last Easter – and it was fantastic! We both deal with some food allergies/sensitivities – and so the holidays can be difficult. If we end up eating something we shouldn’t (lactose, garlic, onion) – we will be miserable for days. So, when she hosted Easter last year, she made up a salad bar along with her traditional Easter spread. It really helped those with food allergies and sensitivities to enjoy the holiday right along with everyone else. And as a regularly very healthy eater, my sister is in the habit of preparing her salad greens, veggies, and protein anyway – so it really wasn’t extra work. It was so successful, that I did the same when I hosted Mothers’ Day. If you don’t want to do an entire salad bar, be sure to add a great salad to the Thanksgiving menu, like this one from the Oh She Glows blog. · Add activity every day to that 4-day weekend this year. I remember the first time that I went to an aerobics class on Thanksgiving morning. It was probably 1995 and I went with my mother and my sister. It seemed like the most insane thing in the world – to be working out ON Thanksgiving Day. But now – I couldn’t even imagine not beginning my Thanksgiving Day without a powerful workout in the morning. Even if you are hosting, it can be scheduled in. Plan ahead and you can absolutely do it! Then, skip that Black Friday shopping and plan an outdoor hike on Friday instead. Plan for one of LeAnna’s BarreMax or Pound classes on Saturday. On Sunday, try Athletic Stretch if you haven’t yet. It’s the perfect way to wind down before launching into the next busy season. All the best Oscar-contending movies come out at this time of year, and with the early sunsets and colder nights, it’s time to head to the cinema. I’ve been at the movies lately (so many amazing ones out right now!) and it is hard to resist that movie popcorn, isn’t it? Here’s a fact: A large AMC popcorn (with butter) has 1030 calories and 41 grams of fat. Yup. AMC. That’s exactly where we went to the movies recently. Loved those seats you can reserve! I also love the popcorn that I make at home – with a tiny bit of oil, popped on the stovetop. Then topped with melted ghee and just a pinch of salt. It’s a little bit of an indulgence, but not even close to those 1030 calories and 41 grams of fat. And no one has stopped me from sneaking in my homemade popcorn! It’s cold. You’re cold. I’m cold. We might be warm again, in, I don’t know – June! So, I totally get the natural inclination towards comfort food. You want something that will stick to your ribs, create a warm glow inside, and give you a feeling of fullness. A cold salad sitting in the office fridge is not going to do the trick. Soup becomes a popular choice at this time of year, but you should definitely check the sodium content if you can. The tomatoes, cheese, and some kind of nut or seed are the key to making this dish feel hearty and homey. I’m not typically a huge fan of the microwave as a kitchen appliance (uneven heating!) but in this case, it really does the trick of turning your basic ingredients into a warm and satisfying dish. Experiment with some layered dishes and I promise you, you’ll find some favorites that will get you through some cold, dark days. At this time of year, nostalgia plays a big role. Do we cling to old behaviors when faced with cold weather and a harsher climate? It’s wonderful to practice time-honored traditions and customs. But it’s by opening ourselves up to new practices and new ways of thinking that we move on and grow. One of my favorite features in People magazine is “What I Eat In a Day.” You know the one – where celebrities open their kimonos and show you just what they ingest on any given day. Usually a Registered Dietitian weighs in (pun intended) to tell you how nutritious this famous person’s diet is – and how (if at all) they can improve. There is usually a total calorie count too. So, I thought I would take the plunge. Of course, the day I chose was not exactly a typical day in that it was a very stormy Saturday in August. I say this because we made a pretty elaborate dinner, we ate in, we had family movie night – it was more like a winter weekend night than summer. This is my After-Saturday-Morning-Barre-Class-With-LeAnna-Breakfast. To make my veggie egg scramble, I start with 1 Tbsp coconut oil heated in a frying pan and add 2 cups of baby spinach and chopped grape tomatoes. After these soften, I whisk in 2 beaten eggs and 1 oz. shredded cheddar cheese. Then I just scramble it all together. It’s not as pretty as an omelet. 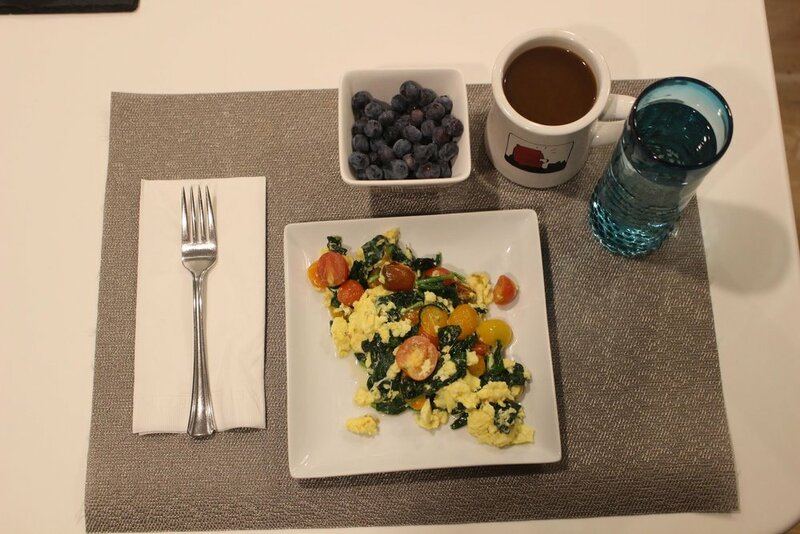 But I’m all about getting as much spinach in there as I can – so who cares about aesthetics. 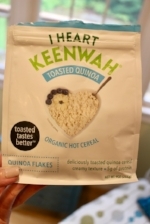 I enjoy this with a side of fresh blueberries, coffee with almond milk and a big glass of water. After a late breakfast, I’m not typically hungry until early afternoon. Also, I’m usually on the go with errands, kids’ sports or activities - or on sunny summer days, beach or pool. So, I literally eat lunch while driving. This is the opposite of during the week when I eat breakfast while driving. So, it makes sense that I swap my weekday breakfast for weekend lunch. 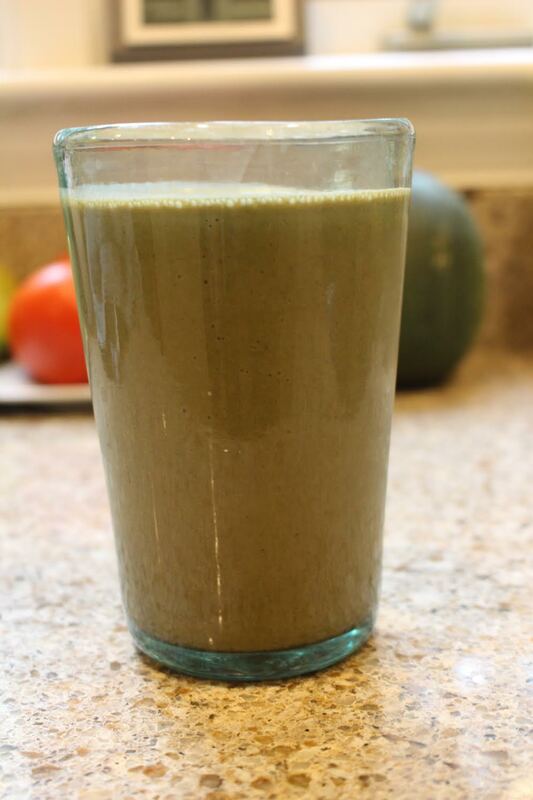 I have been experimenting with my smoothies to find the right mix for my taste and my stomach. I love this version that I learned from Kate Scarlata’s new cookbook, The Low FODMAP Diet. I start with one cup frozen strawberries, ½ cup fresh baby spinach and 1 cup almond milk. After blending that together, I add in 4 ice cubes and crush those. After that, I blend in 1 Tbsp of almond butter. I finish by blending in 1 Tbsp of turmeric powder. Dinner – We typically set aside part of one weekend day to do some “Cooking Ahead” for the upcoming week. Weekday nights are easy when you open up your fridge and find vegetables already grilled or roasted, chicken already marinating, salad greens already washed. With the stormy weather, we did these sorts of things on this particular day – and we tried a new recipe. So, on this night, we had Pan-Seared Salmon with Kale (again from Kate Scarlatta’s new cookbook). For veggie sides, I made a few roasted potatoes (oven roasted with coconut oil and fresh rosemary – my own recipe), grilled eggplant, grilled summer squash and grilled zucchini. After Dinner Snack – Popcorn! 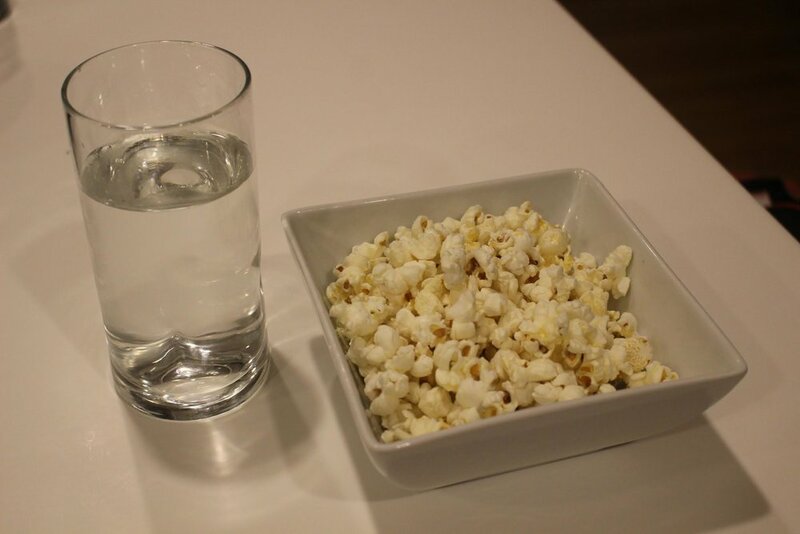 Movie Night Snack – With rainy weather still, we settled in for a family movie night which meant popcorn for everyone. We make ours the old-fashioned way – on the stove with a small amount of oil. It’s crunchy and the perfect complement to the 80s retro movies that we’ve been viewing with the kids. This night’s was My Cousin Vinny (technically early ‘90s, but felt like the ‘80s). Water: I drink regular water throughout the day. Dietitian’s Verdict: I haven’t asked a dietitian to weigh in on this specific day but I have been working with two dietitians over the past few months and both have given me an A+ for my daily eating habits. They feel like I’m getting enough (more than enough) fruits and vegetables and plenty of protein. I’ve been cautioned to keep an eye on sugar (the wine, the chocolate – which I have cut back on). Calorie Count: I use the Lose It app (which I LOVE!) It helps me to keep track of what and how much I’m eating, and finds patterns in my eating that are useful to me. According to Lose It, my day was a little over 1500 calories. Please weigh in! What do you eat in a day? Share your comments and let me know. I’d love to hear!